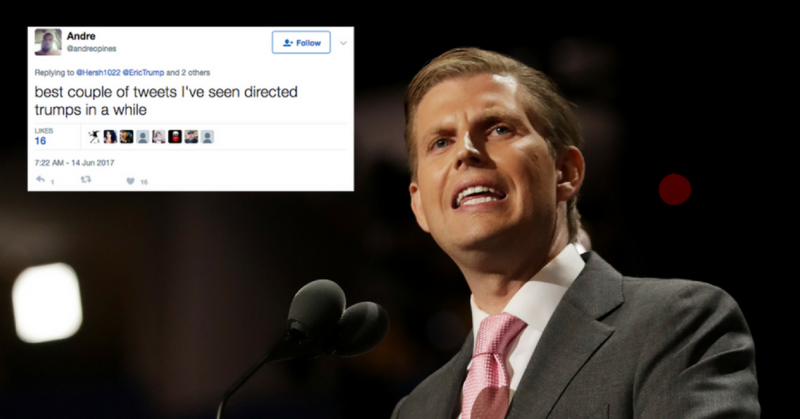 Eric Trump was in a huffy over the mainstream media's lack of coverage about the stock market on Wednesday. Super psyched your money's looking good today though, Bro! Eric later retweeted his father's tweet around the shootings, offering "thoughts and prayers" to those involved, including Republican Representative and Majority Whip Steve Scalise, who was shot in the hip and is in critical condition. Many were critical of yet another empty Tweet of words that won't change anything and just lead to more inaction. The Trump's have never been known for their words of kindness rather take a more callous and business like approach to tragedies such as this. Still it goes to show how little thought goes into the minds of the Trumps in the wake of something people have been begging the administration to fix. Umm -- You tweeted this after the news of the shooting of the congressman broke. Perhaps you don't have the right moral compass. Several public servants were just shot this morning in Alexandria just FYI. So yes, you're probably right, this won't be on TV anytime soon. Eric didn't seem to take much notice. He may have been preoccupied with his father's birthday celebration. Cause that's the important things in life, right? Do you think his Tweet was in poor taste? Hopefully this is a reminder to the Trumps the world doesn't always revolve around them like they probably think. Do better Eric.